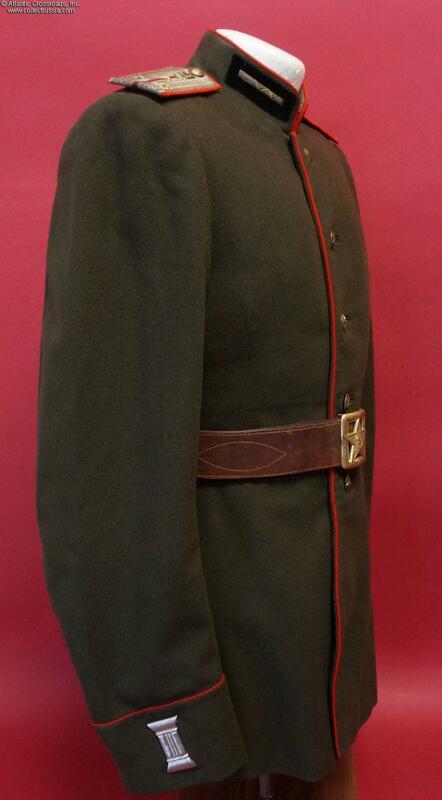 M 1943 "Victory Parade" dress mundir tunic of an Automobile Troops Lieutenant, circa 1943-47. 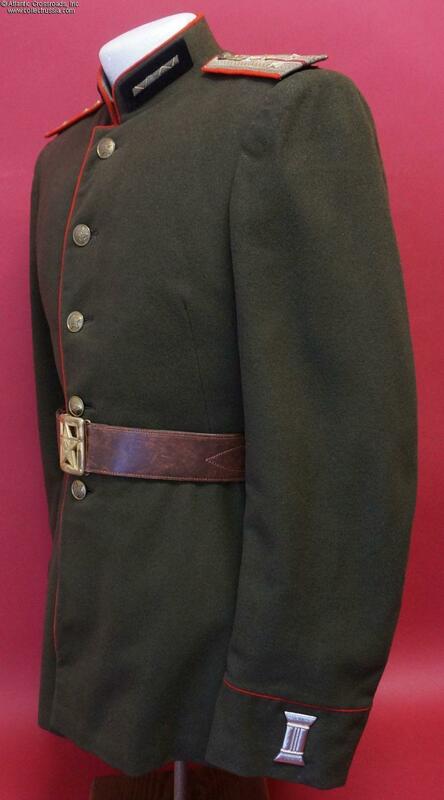 M 1943 "Victory Parade" dress mundir tunic of an Automobile Troops Lieutenant, circa 1943-47. 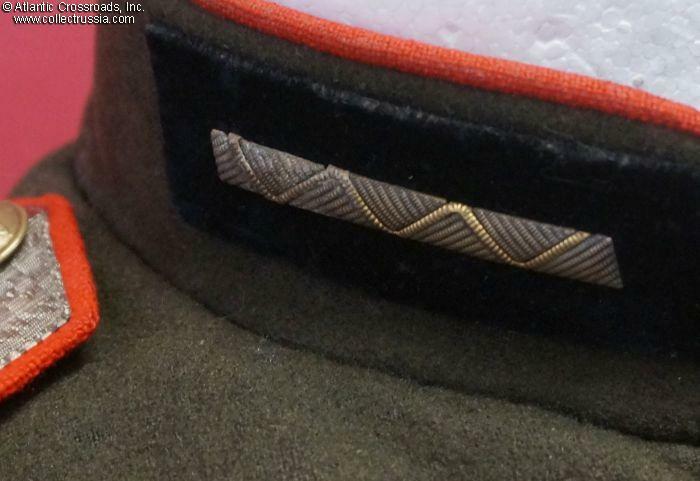 Made in thick, high quality napped olive green wool. 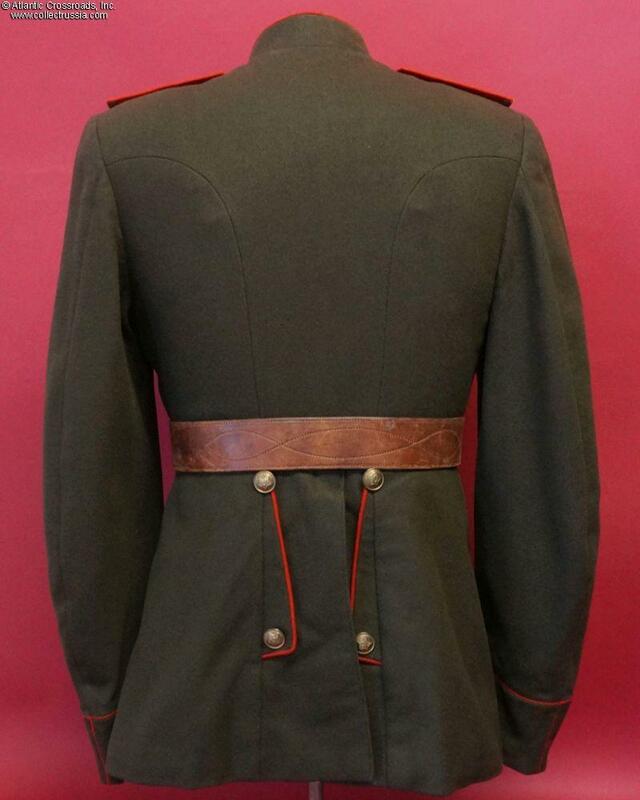 Stand-up collar with red piping on the collar, cuffs and tails. 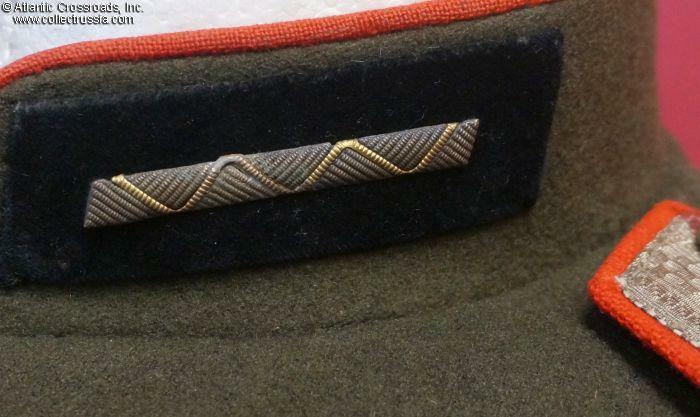 The spools on the cuffs are in silver, as correct for the Automobile branch. With the exception of two that are dated "53" (which are probably a replacement) all of the buttons are unmarked. 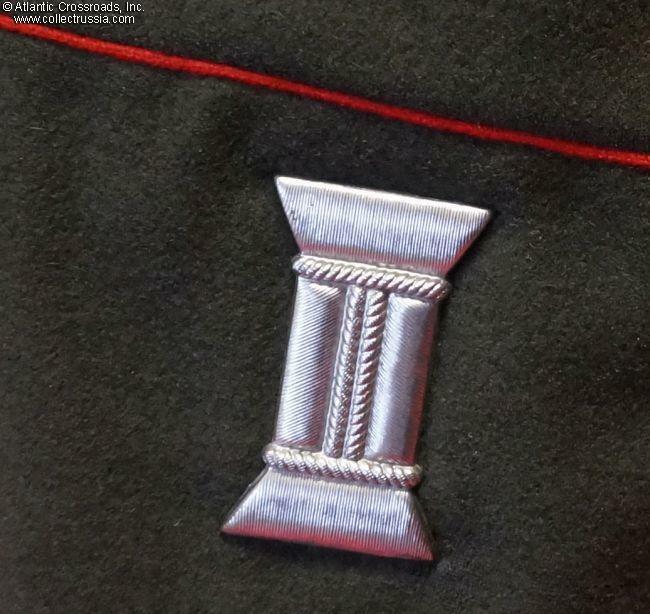 The ceremonial brass buttonholes on the cuffs are pinned directly to the tunic fabric. 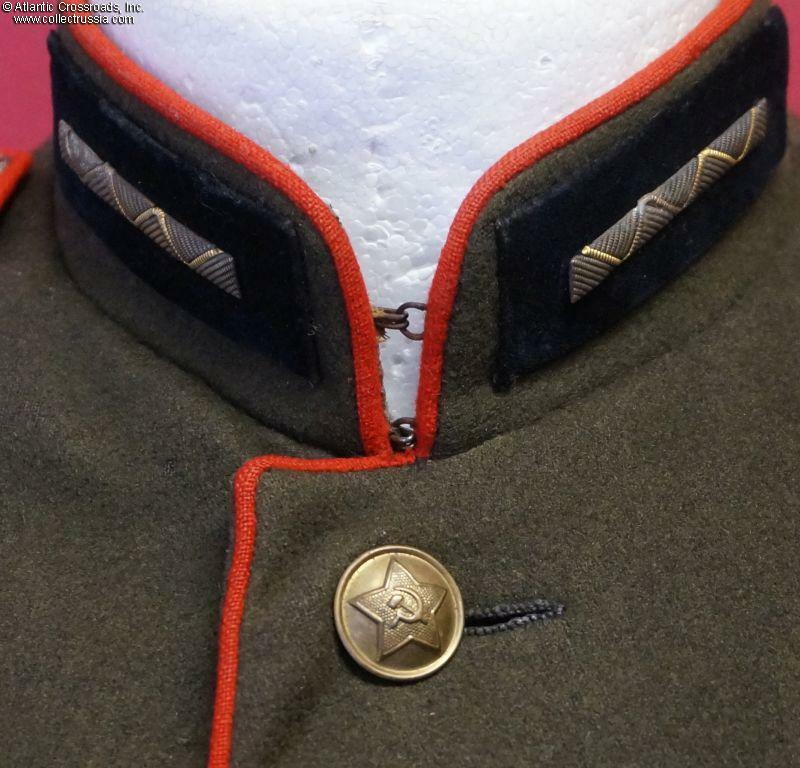 The collar insignia finished in silver are fastened to two black wool rectangles sewn to the collar. There is one perforation in the right breast. 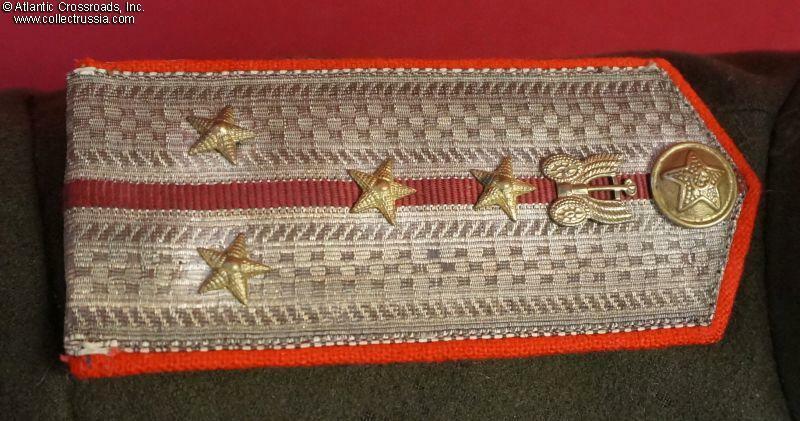 Shoulder boards are five-sided, pre-1947 type, in silver bullion embroidery with gold stars and branch insignia. 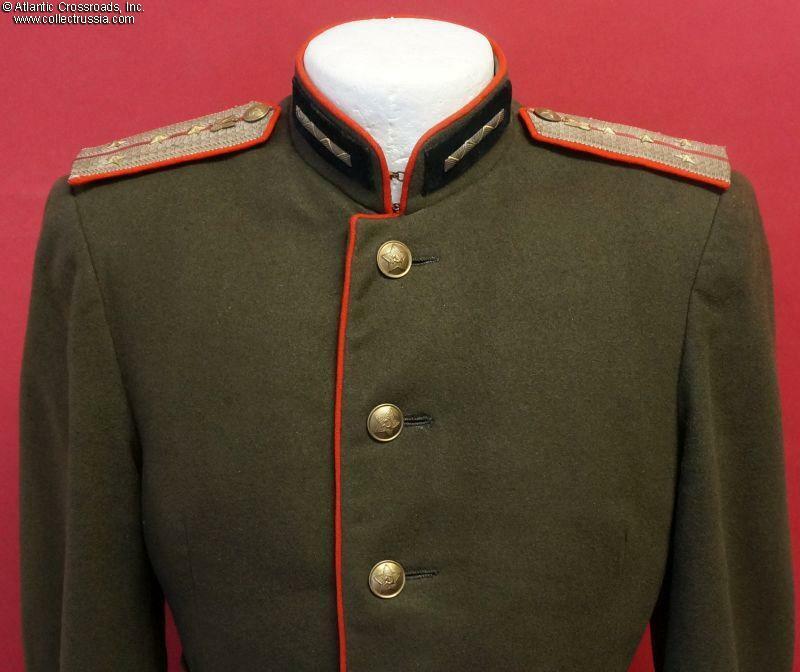 The tunic has about a 36" chest, 26" sleeves (shoulder seam to cuff), and length from top of collar to bottom hem 29". Very good condition. 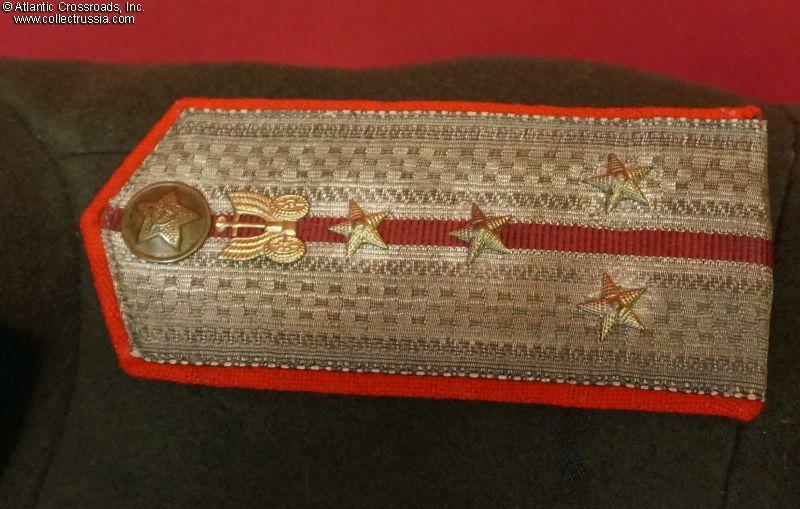 The silver bullion in the shoulder boards has tarnished slightly but remains bright in the areas immediately adjacent to the rank stars and the Automobile Troops branch insignia. 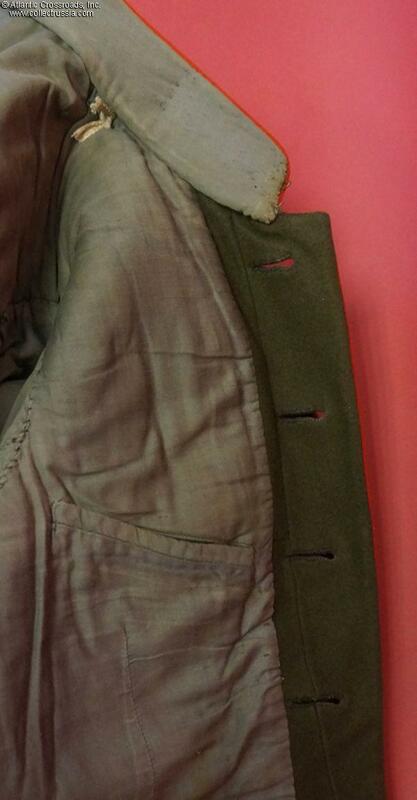 In a raking light, it is just possible to see where a service belt was worn with this tunic. 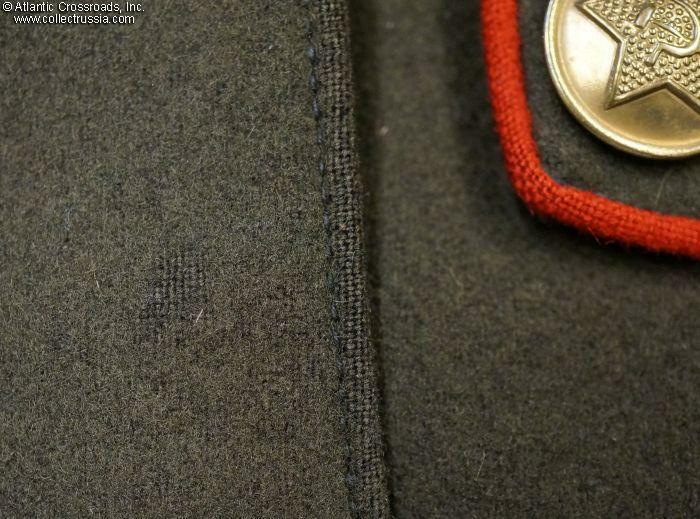 The perforation on the right breast from wearing a badge is not visible from the front, but can be seen on the lining along with a circular mark left by a screw plate. 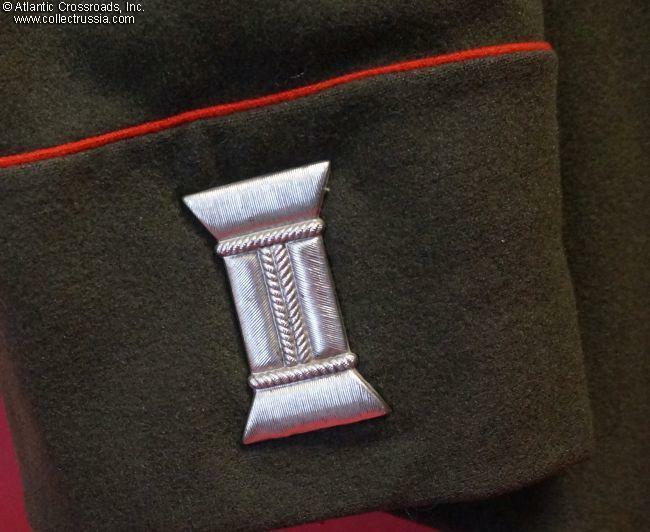 The long pins holding the ceremonial button holes in place are visible from the inside of the cuffs; both show the slight corrosion that indicates that the decorations have never been removed. 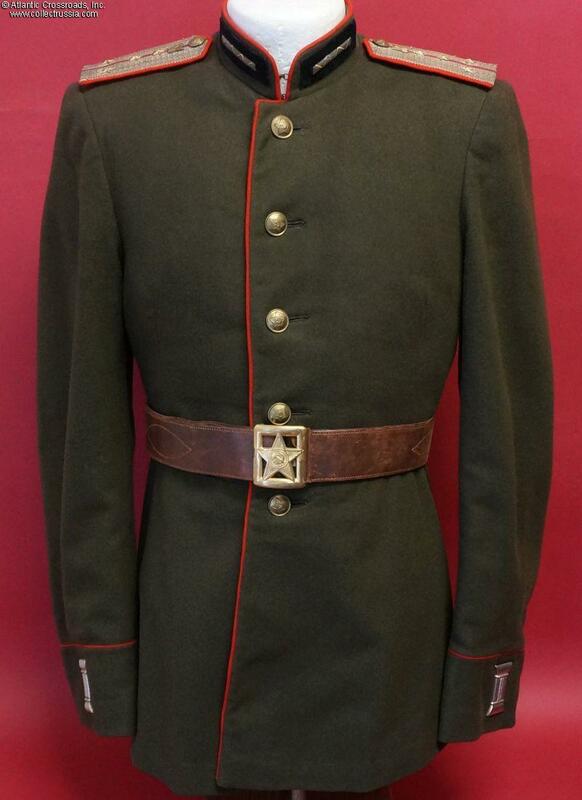 There are several moth trackings on the lower portion of the tunic not very noticeable. While there are no visible perspiration stains on the liner, there is a strong smell of sweat, and the tunic would probably benefit from a dry cleaning. 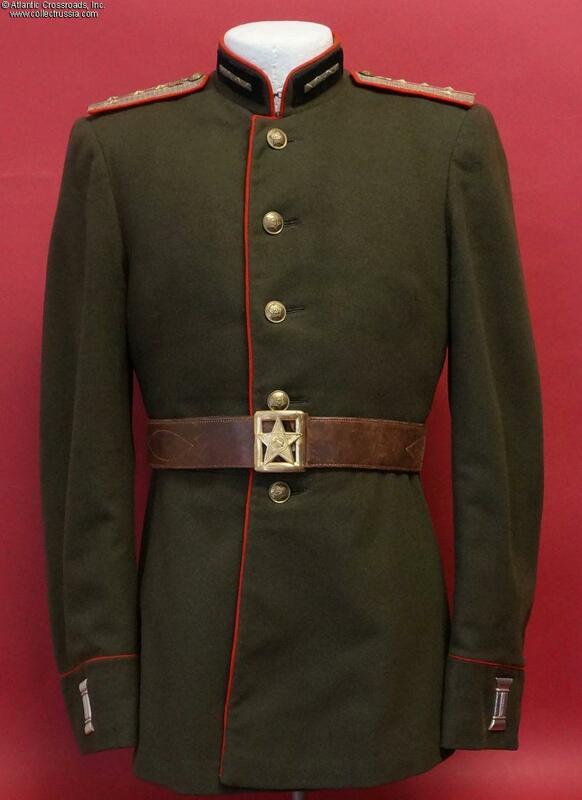 A handsome tunic and one that will eventually become an important part of a Soviet collection focusing on the 1940s.